A good friend of mine, Kristin Reynolds, has just come out with her own dynamic book of poetry - Waking the Dead. Please take the time to check her out. I have found her to be one of the greatest poets of our time. I am certain that you too will come to recognize her mastery in her pages as she takes you into a whole new world. Autumn's Moon is a collection of poetry that shows the many facets of the author's life. It reveals all the drama, the passion, the humor and compassion that lives inside the wondrous soul of a man touched by the enchanted hand. You will see what he sees, feel what he feels and know the beauty that exists in his world. And yes, you will even feel the pains and sorrows that exist there too. Come explore the riches of a truly unique and remarkable individual as he delights your heart with his enchanting spirit. You'll be glad you did. Touched Reality is a continuation of the poetic collections which reveal the truly unique realities found only within the wondrous life of a soul who is truly Touched by the enchanted hand. Explore a new world as the author takes you by the hand to reach beyond the realms of the mundane into a land where the truths goes beyond the boundaries of what you thought were real and into the realm of enchantment. Let your heart see what the eyes cannot reveal. But beware, lest your life may also be Touched by the enchanted hand. 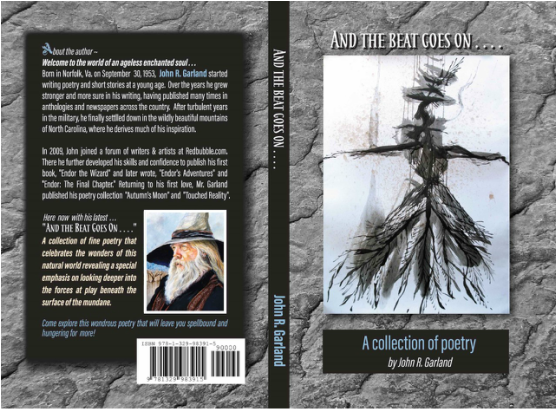 And the Beat Goes On provides the reader with an ongoing dialog into the rich world of this enchanted soul's reality. Let your heart bear witness to the unfolding madness which lies deep within the mind of the insane. Its continuing saga explores the many wonders found within the realm of life's true measure.